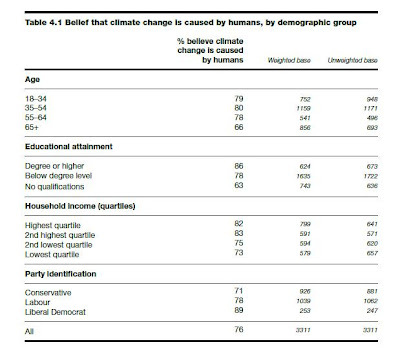 The most recent edition of the British Social Attitudes survey has some interesting findings for those of us struggling with the cognitive dissonance that characterises public policy towards climate change. 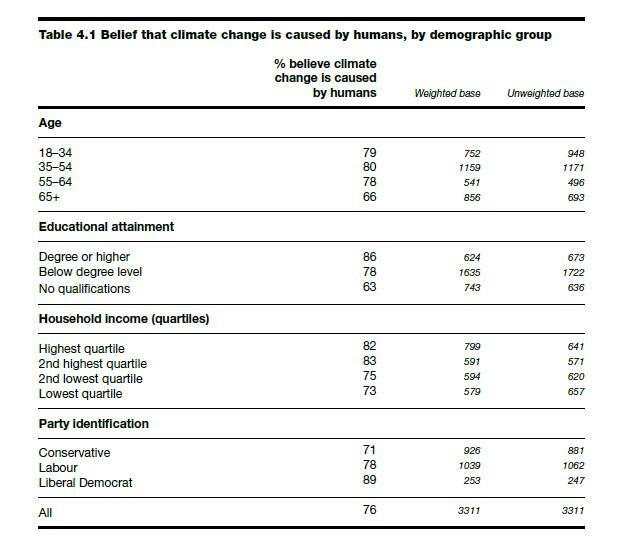 While the government may be chasing after the dollar with heedless disregard for the future of the species, for example by relentlessly increasing the cost of rail travel and increasing the pressure for new airport capacity, the British people are actually convinced that climate change is happening (76%) and that transport is a major factor contributing to our impact on the climate (although this percentage is down from 80% seven years ago to 65% today. It is clear, however, that the failure of political leadership in the field of transport policy is affecting public opinion. If the government produces farcical and trivialising messages about the impact of our transport decisions - as in the notorious example of the advice about solving climate change by driving 5 miles less per week - then we can hardly be surprised if people see little need to change their travel habits. According to the report 61% of people think that they should be able to fly as much as they like, and 18% maintain this right even if it harms the environment. Conversely 55% think everyone should reduce their car use for the sake of the environment, but 47% see no point in doing so unless others do the same. The clear pro-car policies espoused by the Tory-Lib Dem government are a clear signal that others are not expected to do the same and therefore, in themselves, undermine the motivation of the socially and enviromentally conscious half of Britain. What emerges from the data around the perceived impact of transport decisions is that they are driven by the nature of media and political messaging rather than by the scientific evidence. As we passed the spine-thilling 'milestone' of 400 parts per million of carbon dioxide in the global atmosphere earlire this year, the percentage of people in the UK who stated that air travel has a serious impact on climate change returned to its 2005 level (64%), before all those warnings about how climate change is more threatening than global terrorism. And the percentage thinking that car use has an impact on climate change had fallen significantly from 77% in 2005 to 66% in 2011. Human beings are not rational and we are not scientific. We respond to social pressure and to our desire to feel loved and experience pleasure. If people enjoy their two weeks in Thailand enough they can easily convince themselves that this has no impact on the lives of their grandchildren; they can walk the line of cognitive dissonance just like the government does. Many of us have already chosen to abandon flying and driving and live in communities where it is already unfashionable and socially unacceptable to fly casually and frequently. But more important is the need to redouble our efforts to emphasise this as a political message about renationalising railways and reducing the need for car journeys to school or work, because changing our attitude towards travel is a vital political issue rather than a personal lifestyle choice. It's not Cognitive Dissonance that is the problem. The problem is the Ego Defence mechanisms that counter it. We need more CD and we do that by continually presenting the reality that conflicts with their belief system to overload their ED mechanisms.